“Oooh, this one’s gooooooood,” I caught myself saying out loud when I first tasted this tangy, spicy delight. 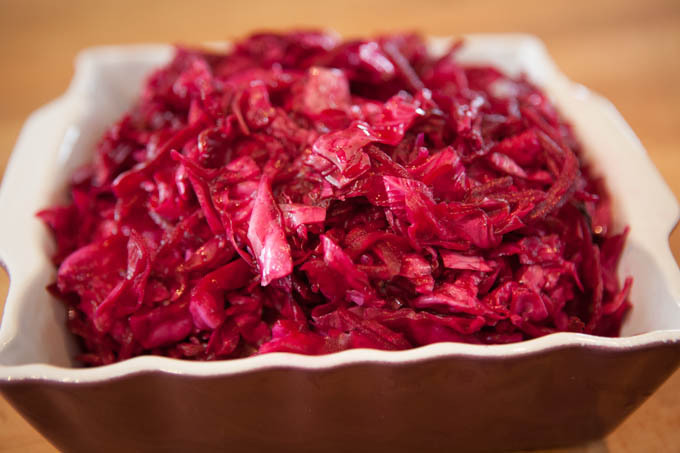 While in some ways it is a traditional kimchi, the first thing that sets it apart is the use of red cabbage (or purple cabbage if you prefer to call it that). 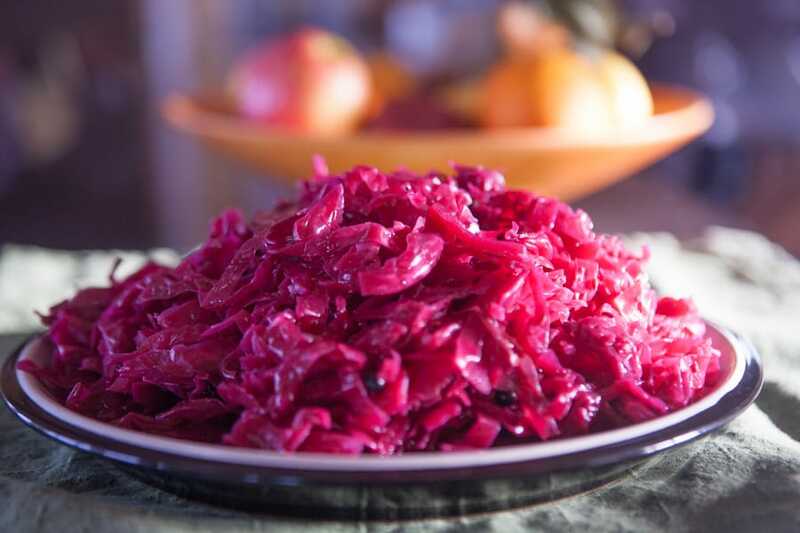 Red cabbage is packed with vitamin C and other nutrients that you don’t find in green cabbage or the traditional napa cabbage commonly used for kimchi. I used more spices too: Fresh garlic, ginger, onion and turmeric to go along with the red pepper flakes. 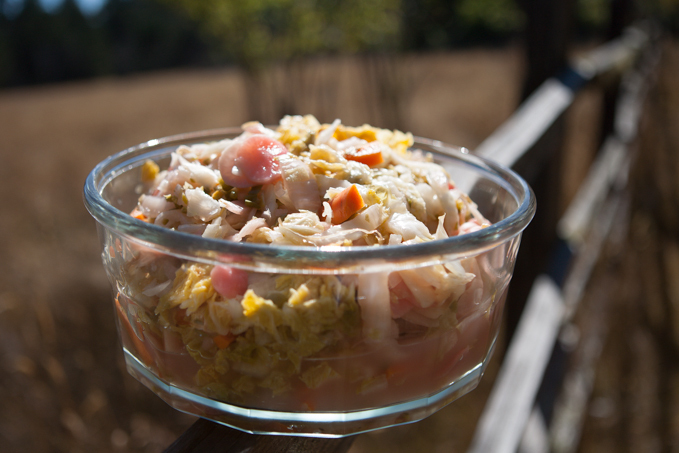 I also chose to salt the veggies as is commonly done with sauerkraut rather than make a brine more typical to kimchi. Just wanted to try something new as I like to experiment and it came out so well I’d definitely do it again. I very much like this one and think you will too. 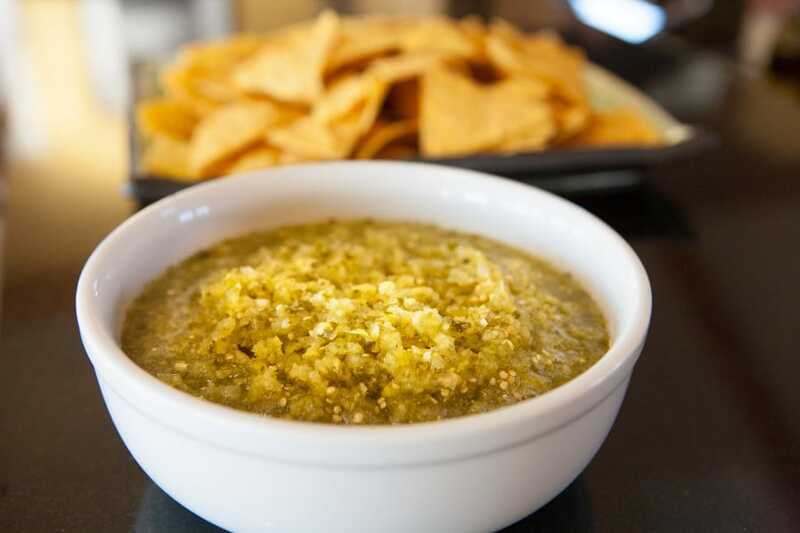 Simple to make and even easier to eat. 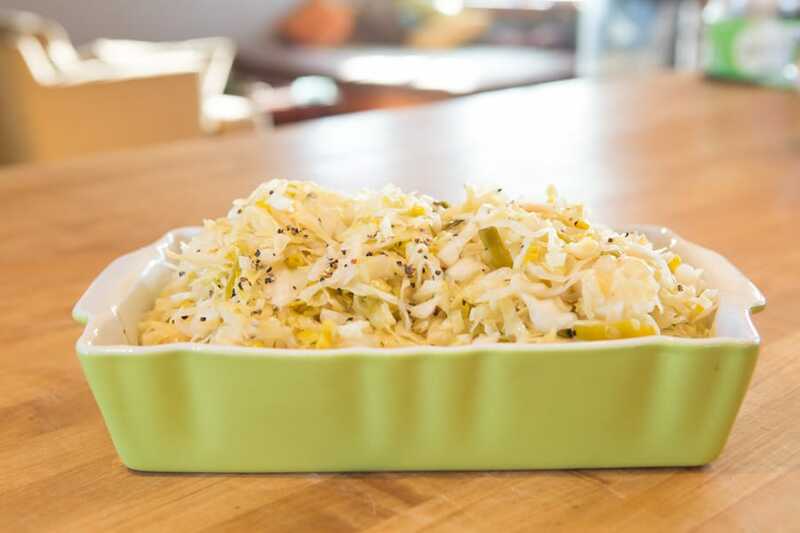 Lightly wash the cabbage or peel off the outer leaves if they look a little distressed If you don’t remove any leaves, clean the outside of the cabbage gently. 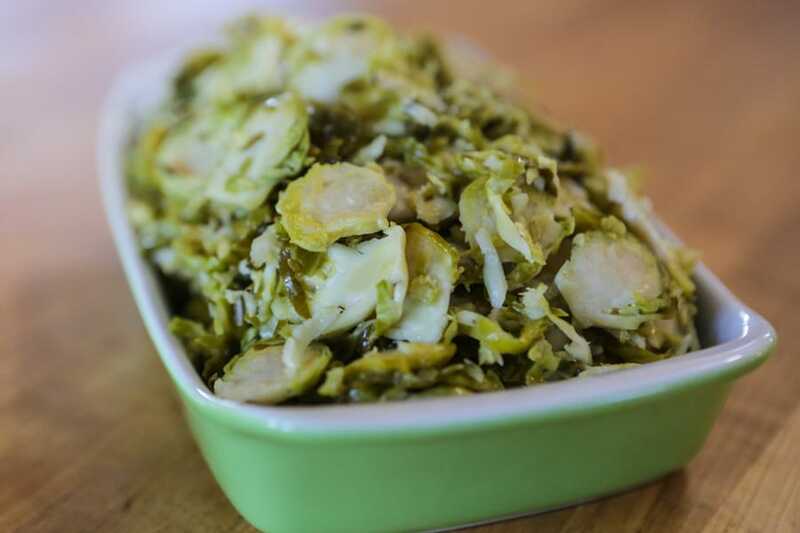 Slice the cabbage into strips approx 1/4″ wide. (the size isn’t that important, as it’s more of an aesthetic decision that anything else). 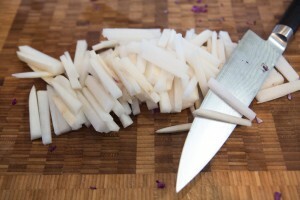 Gently wash the daikon and cut it into strips about 1/4″ x 1/8″ x 1 1/2″. Again, the exact size is more of an aesthetic choice. 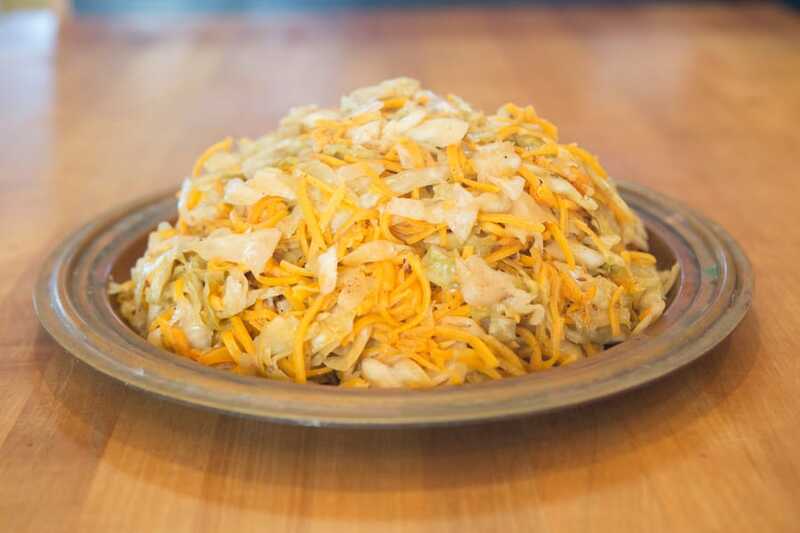 Place the cabbage and daikon in a large bowl and toss with the salt. 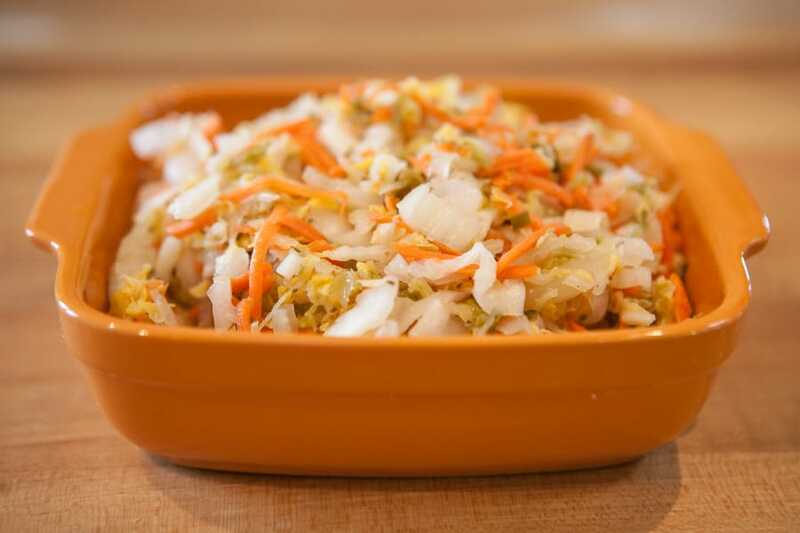 If the quantity of you cabbage and daikon which you use is different, the salt ratio is approximately 1 Tbsp salt for each 1 1/2 lbs of veggies. See Measuring and Using Salt in Fermentations. Let it sit for an hour or so and toss a few times. Take the ginger, turmeric, garlic, red pepper flakes and onion and mince and combine. 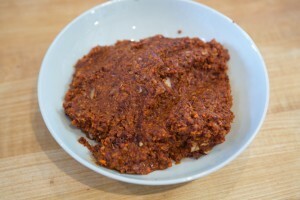 I find mixing pastes such as this are easier In a food processor (I use a Cuisinart Food Processor), but good old fashions knife and cutting board works just fine. 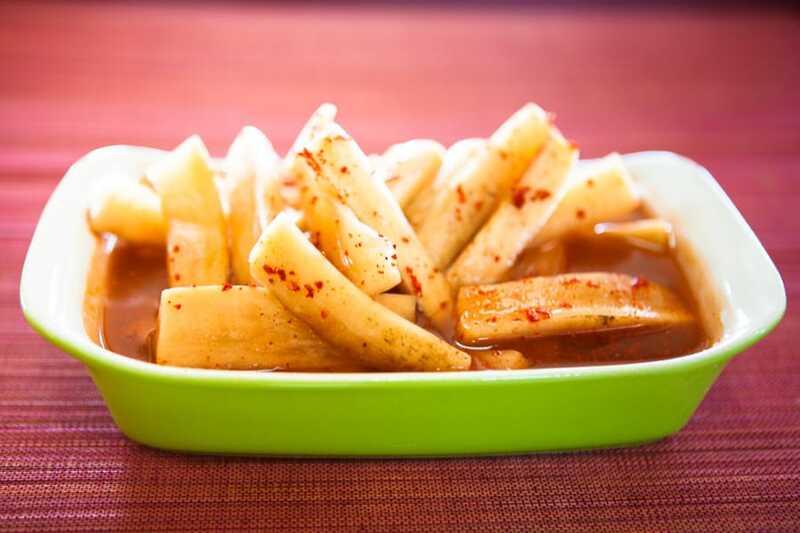 Once the cabbae and daikon have sat with the tossed salt for an hour or so, combine with the spice paste. Mix well to distribute evenly. 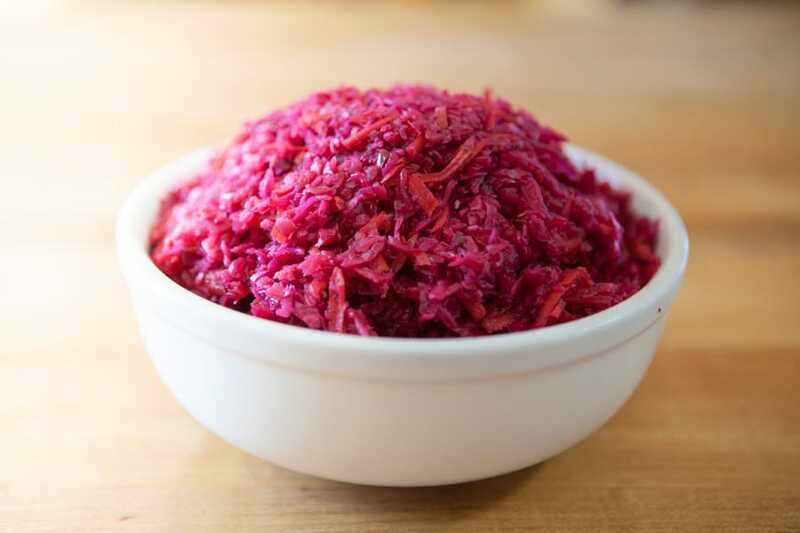 Take all ingredients from the bowl including the liquid which may be pooling at the bottom and place in your fermentation vessel. If you’re looking for one, I personally use this one which comes from Poland, but this fermentation vessel should work fine. For a lower cost option, I’ve also used 1 gallon Anchor Hocking cookie jars. 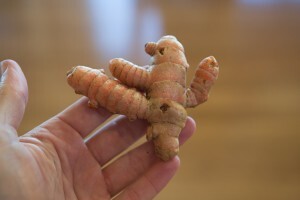 Compress the ingredients in the vessel by pressing down with your fist. Your goal is to have the liquid rise to more than cover the ingredients. Place a weight on top of the ingredients. If you use a fermentation crock, then it should come with it’s own weights. If you use the cookie jar approach, you can take a large bottle filled with water and use it as a weight or fill a plastic bag with water (be sure it doesn’t leak first).If the liquid doesn’t yet rise up sufficiently to cover the vegetables, don’t fret just yet. Just give it some extra time, perhaps up to 8 hours or overnight. Compress again. If the liquid still doesn’t cover it add some water and mix it all up good so the already dissolved salt is well distributed. 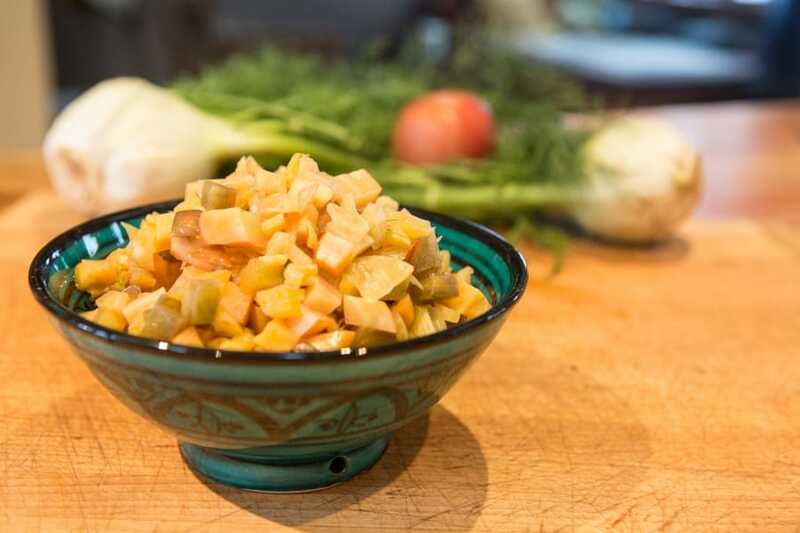 The more fresh your ingredients are, the more liquid will nautirally leach from the veggies. The point of covering it is to keep germs and molds from entering your ferment, while still allowing the ferment to breathe. 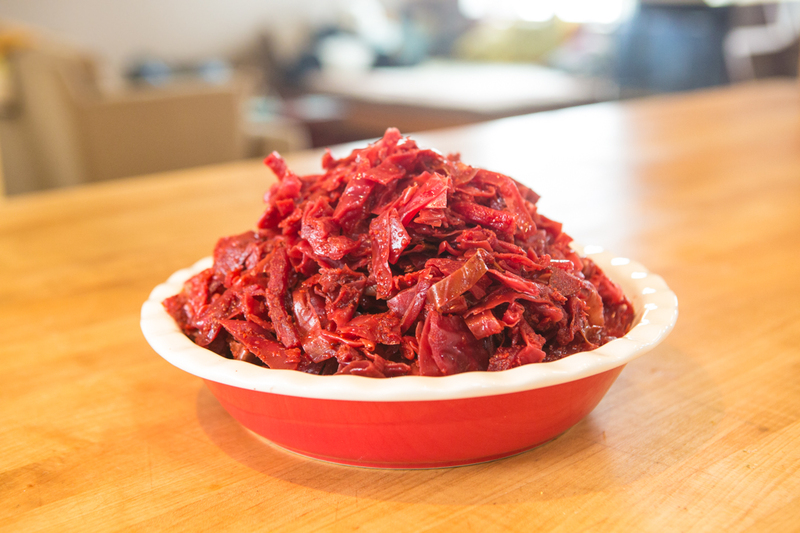 You don’t ever want to cover a ferment tightly until you jar it up and put it in the fridge. Leave it to ferment for about 3-4 weeks. 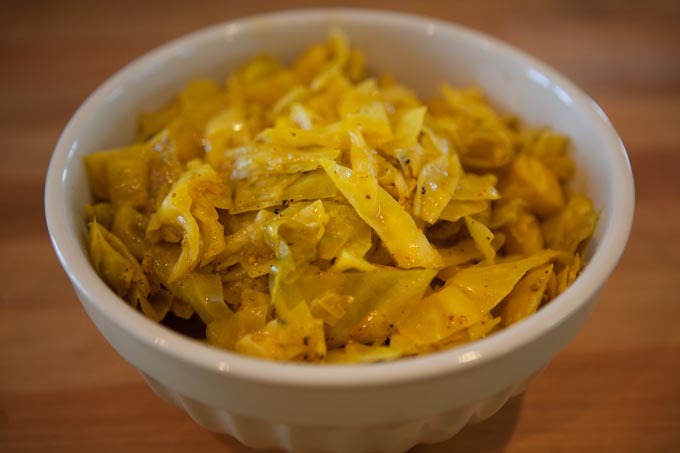 Other kimchis can take less time to ferment, but the longer ferment is important when working with fresh garlic, ginger, turmeric and onion. If you taste it occasionally through the fermentation period, you’ll see how the intensity of those spices settles down over time. 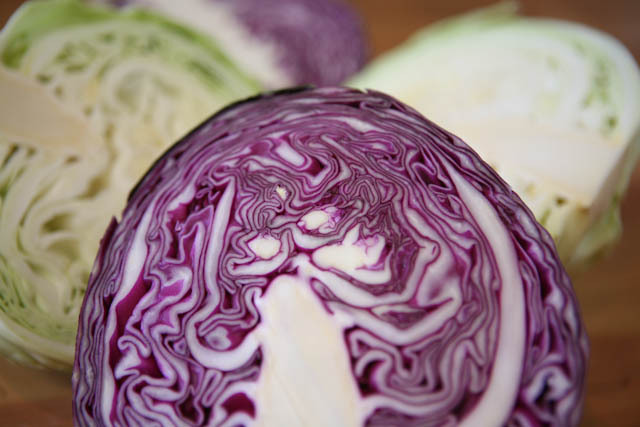 The tartness from the cabbage can develop over time too which helps make the overall flavor more complex and appealing. Be cautious to always use clean hands and limit the amount of time the lid is off during your tasting forays as you don’t want to introduce mold spores or other microorganisms. This helps to significantly slow the fermentation. 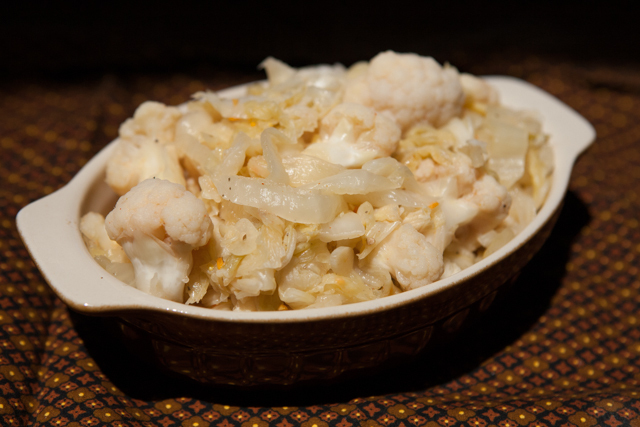 This ferment is nice served as a simple side dish with asian or rice dishes. Next time you go to your refrigerator with the munchies, take a fork with you and pop open a jar and nibble away while you’re trying to figure out what else you might want to eat. As I often do, I suggest making a lot and then giving it away by the jar. I made a double batch of this which made some of my friends happy. These little bacteria give so much to our fermentations, it’s only fitting that we do the same for our loved ones! I just got my set up for fermentation and look forward to trying this out. I’m new to this and really like what you have done in getting these recipes out in you e-mails to me. keep up the great work and please keep sending those e-mails to me. This one sounds really good. As I read it, I’m sipping brine from a September 2015 batch that’s just about gone. I don’t recall exactly what’s in it, but it’s not quite like your recipe above. I’m happy to get more interesting recipes in your emails. I gotta try this one! 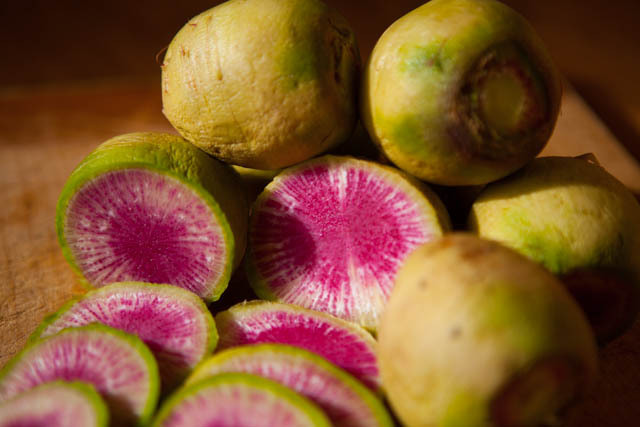 After tossing with salt, should you rinse the cabbage/radish? No need to rinse. Let the salt remain throughout the fermentation processs. Good luck! 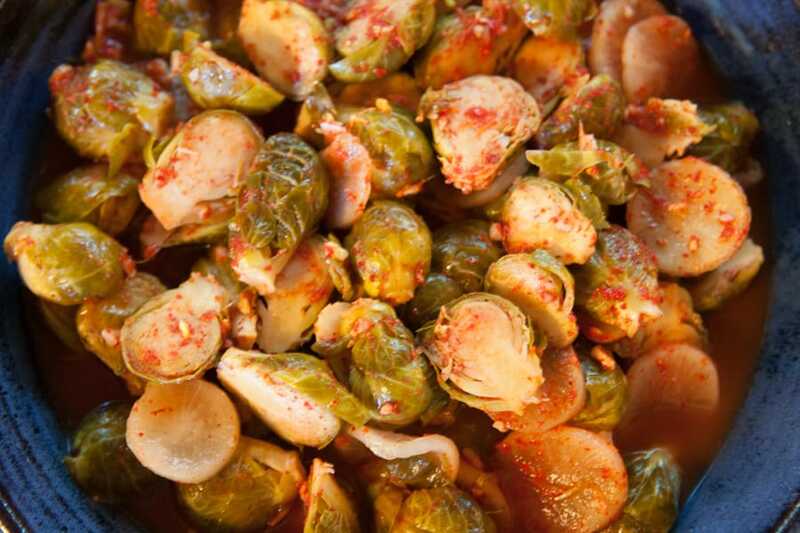 You say ‘red pepper flakes’ but you call it kimchi cabbage. 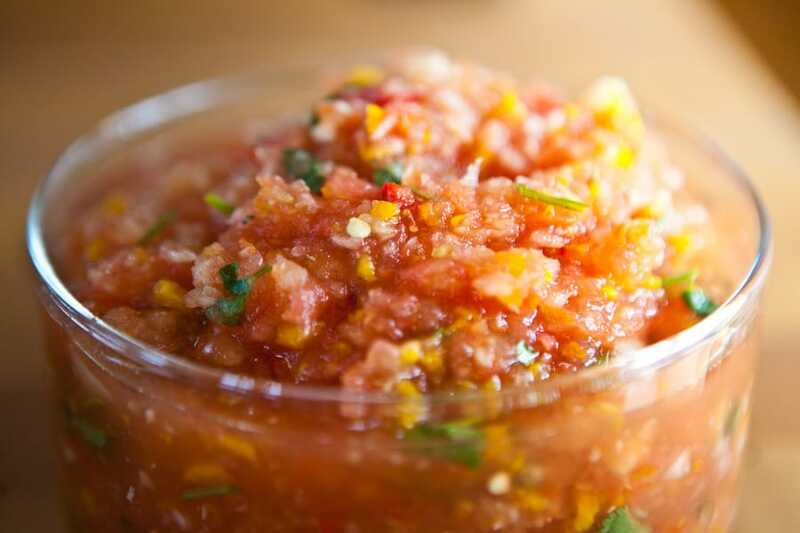 Are you using regular red pepper flakes or korean red pepper flakes? The quantity makes me think it’s the latter but I do have both. Thanks! I’m using Korean Red Pepper flakes. Judging heat in a recipe is always a little tricky since there can be such a variation in the heat in different peppers. Welcome and good luck! Thanks for the quick reply! I’m making it right now and have another question. The ingredients say you’re using 3.5lbs veg. Even trimmed and chopped let’s say 3lbs prepared plus 1.5 Tbsp of salt. 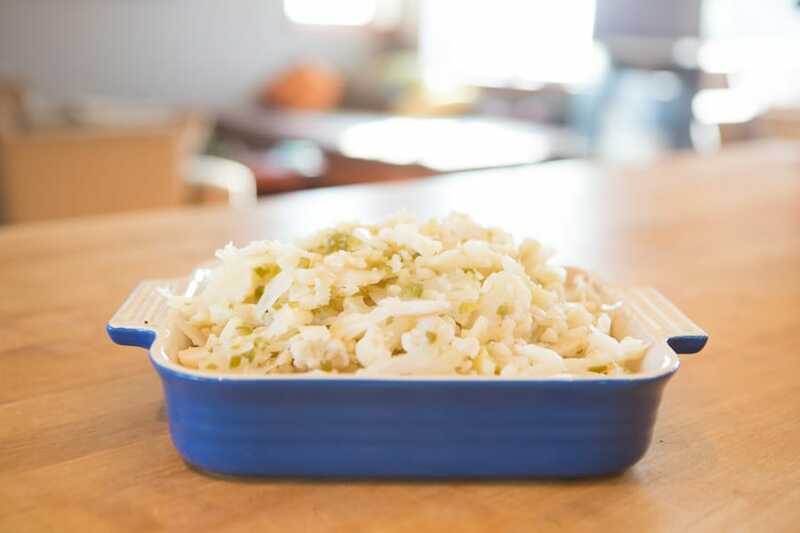 But the ratio you give in the recipe is 1 tbsp for every 1.5lb of veg (which is what I normally use for sauerkraut). If that were the case then you should be using 2 tbsp not 1.5. 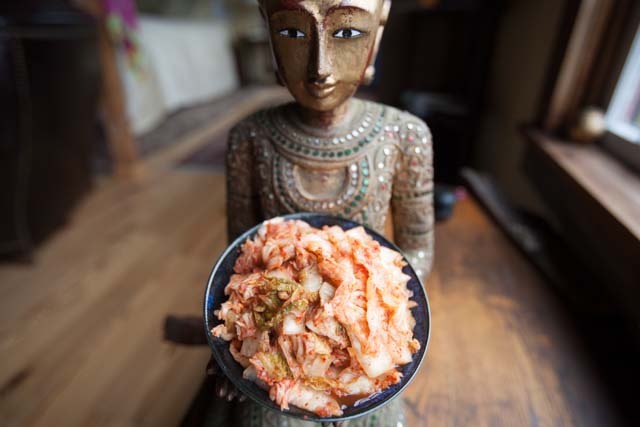 This might seem pedantic to some but the salt ratio is important and as you point out, this is a different type of kimchi by leaving all the salt in, so I want to get it right. Thanks Lulu, you’re awesome! I’ve updated the recipe to say 2 Tbsp salt rather than one. 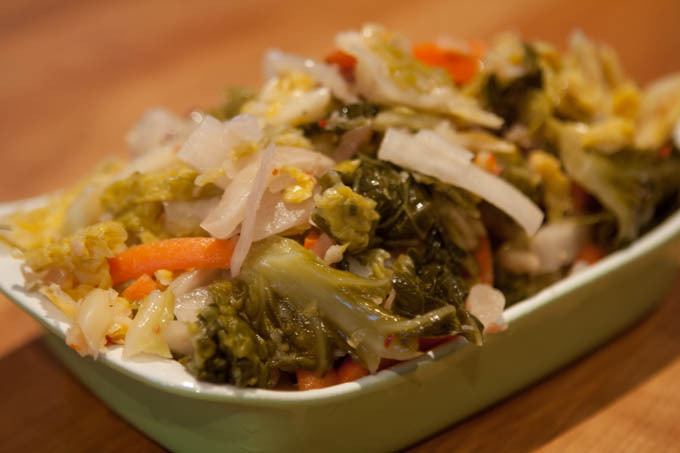 I love to “wait impatiently” for these incredible fermented veggies! I was just eating some of this out of my fridge the other night. So good. Good luck! Hi”Ted”. I’ve never fermented or pickled anything from scratch, I just put veggies in previous juices in the store bought plastic jars the kimchi or pickles came in after finishing what was in the jars. Usually they’re plastic jars and as long as there’s juices left I add many things and put them in the fridge. 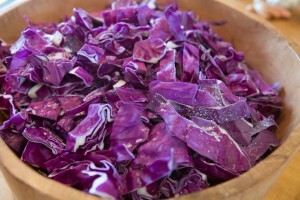 Is that okay to do with red cabbage? I suppose that’s fine, Sonya. 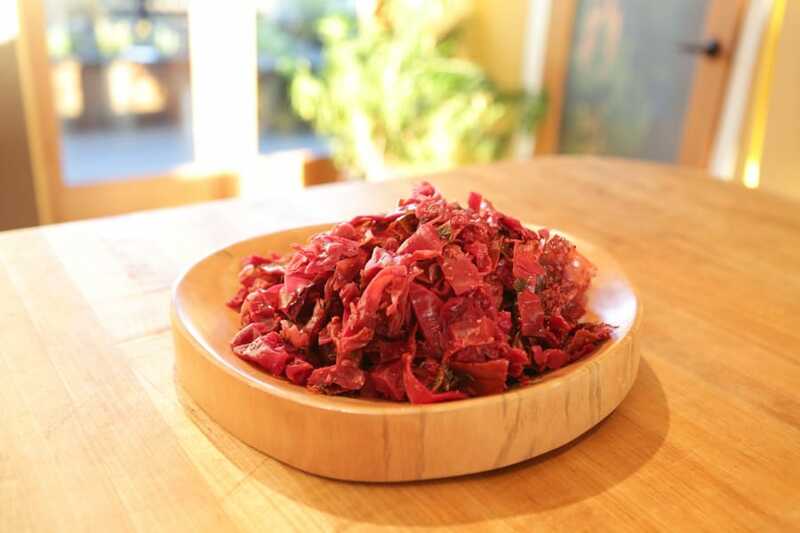 Just so you know, there are a few stages in the fermentation process where, as the ferment progresses, the predominant strain of bacteria present changes as well. The final stage bacteria are different from the early stage bacteria. 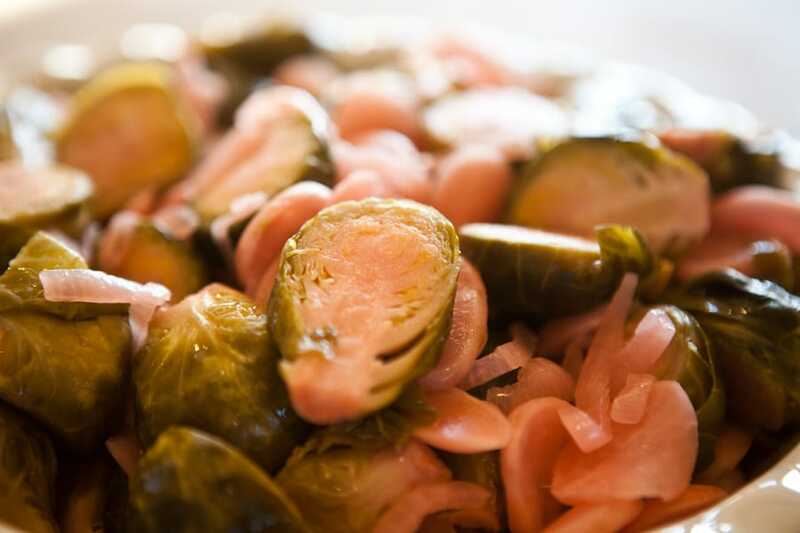 You may simply be “pickling” your ingredients in the more acidic brine of the previous batch rather than truly fermenting, especially since you are placing directly in the refrigerator which significantly slows any fermentation process. As basketball players say sometimes, “no harm, no foul,” but it may not really be a fermented product you are creating.